I’m an Aussie queer (abrosexual, aro, genderless/trans), white, Australian, adult, autistic writer with depression, anxiety, insomnia, migraines, chronic hand/shoulder pain and a personality disorder/s the psychiatrists refuse to formally diagnose beyond mentioning clusters. (I’ve had BPD and AvPD mentioned. I am hellish avoidant, though.) I write fiction about neurodiverse, queer characters and am passionate about media and representation. Oh, and I own a great many stim toys! Stimming, after a late autism diagnosis, is something I’ve spent the last two years relearning and reclaiming. If you’d like to support me while I review toys, fix Tangles and ramble on about autism, neurodiversity and disability, please consider buying me a ko-fi. Every little bit helps keep a roof over my head. Thank you so very much! Preferred Stims: Anything that involves fidgeting and/or texture, although I also love items scented with natural essential oils. I’m good with crafting, DIYs and fidget toys of any kind. I cannot comfortably sit still, so anything that allows me to move in some way is a good stim. Metal music, fidget toys, walking about, sewing. My chronic pain has complicated this! Least-Preferred Stims: Any chewables that aren’t designed for light chewers. Toys that flash light or make fast, rapid flickering movements, as these can trigger migraines/partial seizures/sensory overload. Squishies with sharp, strong artificial or chemical odours, as they trigger migraines. Top: a red apple squishy, a coloured soccer-ball stress ball filled with crunchy pellets, a red prickle ball. Second row: a mini Mickey Disney Tsum Tsum plush, a pink/blue/yellow/clear Tangle Jr Textured, a purple/blue/pink mini snake puzzle, a yellow stretchy squish ball, an aqua and pink serpent puzzle. Third row: a yellow/dark blue/light blue/purple/red/green Tangle Jr Fuzzy, a green prickle creature, an orange makeup blending sponge. Bottom: a long, wearable bead lanyard I made with a bead ring attached to the end. My ultimate favourite toy would have to the the Tangle, in all its formats save the Tangle Hairy. (The fronds quiver when moved and, visually, I find it overwhelming.) I have a drawer full of Tangles and ones stashed in most of my bags, kits and dressing gowns; it is by far my most-used toy. My favourite Tangle is the solid-red promo Tangle Jr Fuzzy, because it’s red and because it’s flocked. 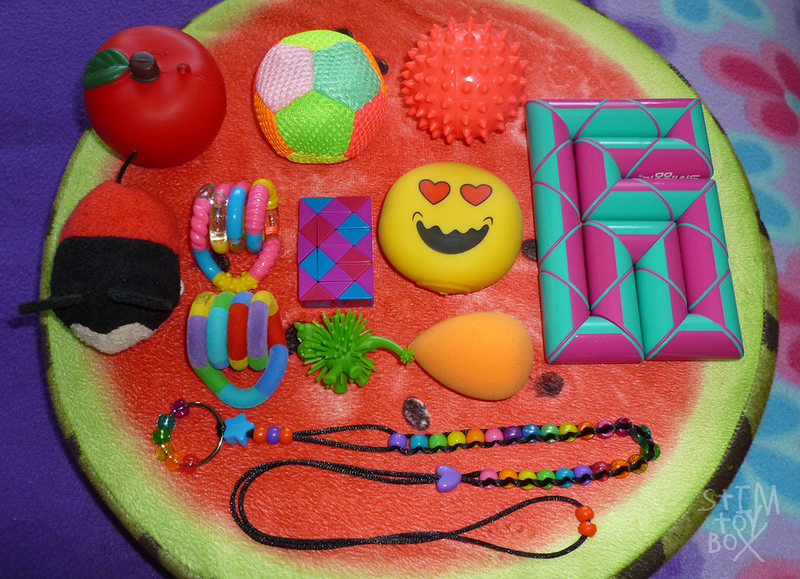 Other toys I use frequently include spinners, squishies, infinity cubes, prickle/massage balls, putty, slinkies, textured silicone chewables that can double as a fidget pendant. I enjoy fidget cubes, but they’re often a little rough on my hands, so I have to be careful. My dream toy wishlist includes a Tangle Original Textured and a Tangle Relax, neither of which I can afford to buy locally.